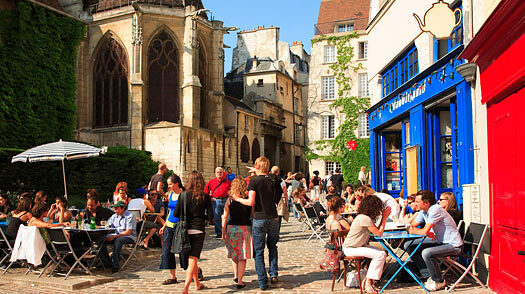 A marsh until the 12th century, the Marais has led many lives  parade of grand villas, Jewish district, gay nightspot. It's also a famous shopping precinct, its boutiques and ateliers supplying Paris's yen for simple things done beautifully. Stock up here on smart staples for your wardrobe, writing desk and larder. Ashen knits and dove-colored cottons are on offer at Loft Design By, a company founded in Paris in 1989 by Patrick Frèche. Next, select some fresh-minted stationery from one of the many papeteries on rue du Pont Louis-Philippe  the original, Papier+, has been setting a high bar since 1976. Then sample some organic olive oils and goodies at the newly opened Premiere Pression Provence  the shop has dozens of oils, but we recommend beginning with the award-winning Domaine Les Bastidettes. The candy-pink sidewalk table bears seasonal specials.